Day two of my perseveration on horse shopping. The first step to buying is knowing what you want. I don’t. Back when Previous Horse was retired and Mathilda was a sprightly, young 20-something, our goal was to gradually locate replacements for both horses. As I said back in January, “This has been the plan all along: one fancy show horse for me & a husband horse that could double as my second horse, not as talented but fun. A sports car & a truck if you will.” [Truck Shopping] Clearly, Rodney was intended to be the sports car, or luxury sedan as it turned out. So which to get next? My brief, happy career with a jumper string. Or find an upper-level horse looking for a happy, working retirement. Yes, an older horse looking for an easier gig is a gift for us lower-level critters. It does happen. After all, somebody has to win the lottery. Then again, with the best of intentions, it may not work out for soundness or rider compatibility reasons. Other times, intentions are not the best. But even if I was handed a set of reins to an amiable, four-star horse & told, “Here, he’ll pack you around Training.”, there is something unutterably wearying about the idea. Either I lack the fortitude to go down that road again or an insufferably optimistic part of me still harbors the hope that Rodney will be that horse. For now, no hot rods. “A non-Thoroughbred might be fun. Get a Morgan or an Arabian to cross-show in jumper classes at breed shows (do they even have these?). I used to show with a woman who did this with a Quarter Horse and earned herself a big-time belt buckle.” [Truck] You know, I know, and the universe knows that I will end up with yet another bay, Thoroughbred gelding. It doesn’t hurt to start out open-minded. I’ve never been particularly brave about getting on strange horses. 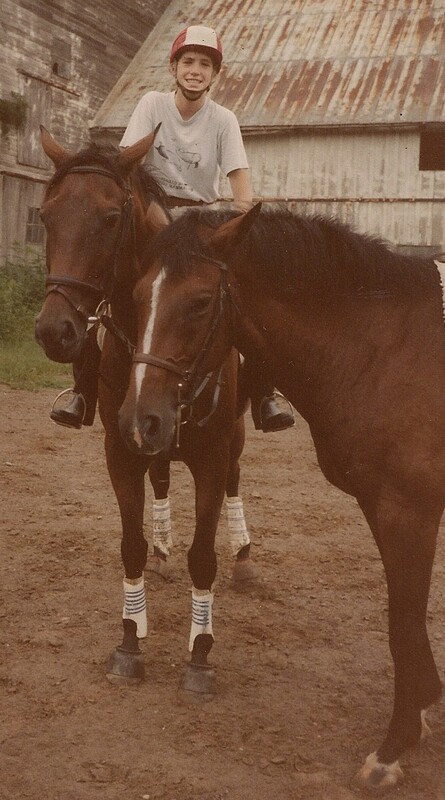 It took me years to get up the nerve to ride the mare I’m holding in the picture. (When I finally did, we had an absolute blast, but that’s another story.) How can I face trying out horses when it’s been over a year since I’ve even sat on one? Perhaps that is the test. A horse I can face riding now would also be a horse that would continue to bolster my enthusiasm and confidence in the face of the Amateur Operatics that are the life of a Thoroughbred. OTOH, is it fair to ask a horse to carry that much psychological baggage? I’m also concerned about introducing a third horse and sorting out the resultant herd dynamics. Again, a calm, sensible soul would solve more problems than cause them. Of course, a solid citizen who was also gorgeous & talented would be nice, but until they invent holodeck horses, I must be reasonable. Plus, there is a side-effect to finding Mathilda’s replacement. There’s nothing like bringing in the replacement dog to have the original dog live forever. Leaving aside the question of whether this paragon exists & how to find him or her, is looking for a “truck” horse wisdom or wimping out? Wisdom. Because the ‘truck’ horse will help you get your mojo back, and when you judge Rodney has found his, you pass the truck horse on to hubby with a clear conscience. re Hubby horse: …which I can then borrow back whenever I need to reup the mojo. re Appendix: Aren’t some QHs & 1/2 QH all but TBs anyway? I recall a major QH stallion who turned out to be TB? Or am I channeling this? Sounds like you really needed my TB that I just sold in January (my “truck,” because I wanted a “sports car”). He took my husband from not knowing how to ride to four cross-rail shows in a year. He packed around any Novice the USEA had to offer, and Training C.Ts. Knees-to-eyeballs hunter style jump, lazy, good on trails. Although I also like having my new 4yo “blank slate” horse… he has a good mind so he doesn’t try to kill me, but I can start him from scratch without bugaboos (hopefully) re: dressage and XC that horses in the past have had. I’m thinking a young-ish lazy TB or stock breed/quarter-draft/grade horse that is sensible and somewhat green, maybe w-t-c and cross-rail started, that you can both have fun on, that has enough talent for 2’6″ H/J and BN eventing… just a thought based on everything you’ve said (that Rodney is truly the one to be the big-time eventer). why not go for both? though it’s hard to picture you on anything but a bay TB gelding, lol! i still really miss having a horse. the bits of avenel shown in the photo brought back some memories…. I have read the entire blog, so I can guess the top three reasons why this doesn’t work for you. In the spirit of paradigm shifting, I will suggest it anyway, because there are times when it’s not wrong to consider shifting your paradigm. What about a lease? It would be a good idea for you to get in the saddle again to gear up to looking at trying sale horses, a ‘temporary horse’ buys you some time to consider the longer term options and I can’t think up a third reason, but am too lazy to backspace and change the structure of this sentence. Of course, I’m from an area where lease horses were always around and about, kids leaving for college, pregnant ladies, people taking a break, older horses being put into reduced work, so it’s possible this sort of thing just isn’t available in your horse area. But what if you trolled the CoTH lease/giveaway as a starting place … just to see what might out there?